When the Space Shuttle hit the Earth’s atmosphere on its return trip from the cosmos, it was traveling at 17,000 miles per hour—25 times the speed of sound. Were it not for the protection of the ceramic tiles that acted as heat shields, the entire spacecraft would have burned to nothing. Now, Pollock, chair of the materials department at UCSB, has received one of 13 prestigious 2017 Vannevar Bush Faculty Fellowships from the U.S. Department of Defense (DoD). 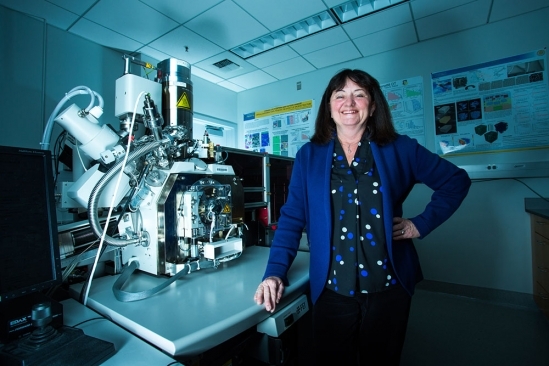 The award includes $3 million to fund five years of Pollock’s research, which is aimed at developing a 3-D platform for discovering new materials capable of operating in extreme environments such as those experienced by rockets, aircraft engines and hypersonic flight vehicles. The fellowship program provides awards to top-tier scientists from U.S. universities to conduct revolutionary “high risk, high pay-off” research that addresses the “hard” problems that DoD needs to solve. In recent years, it has become possible to use both laser and electron beams to “print” engineering objects that have complex shapes. The process involves melting and fusing metallic powder particles—each about 10 times finer than a grain of beach sand—in millimeter-scale “pools” created by local focusing of a laser or electron beam. According to Pollock, the 3-D platform will enable exploration of previously inaccessible design spaces of higher-dimensional compositional materials and will also provide rapid acquisition of 3-D information about the materials‘ chemistry, structure and crystallography—from the nanometer-to-millimeter length scales critical in emerging approaches to additive manufacturing.